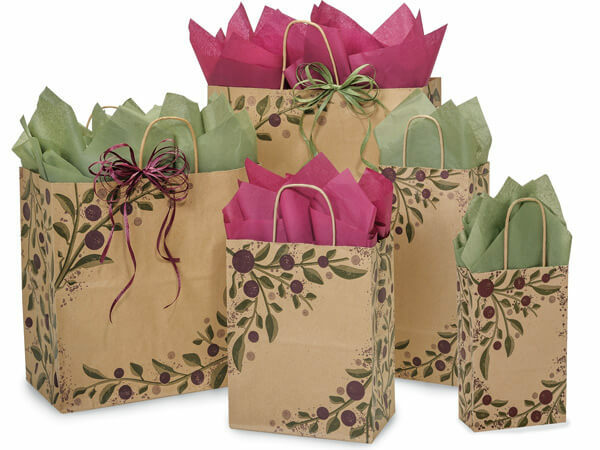 Tuscan Harvest Shopping Bags are made from 100% recycled paper and coordinate with our Tuscan Harvest Collection. Green Way ® Eco-Friendly Packaging. Bag Assortment contains 150 Bags Total: 50 Cub (8" x 4-3/4" x 10-1/4"), 25 Rose (5-1/2 x 3-1/4 x 8-3/8"), 25 Filly (13" x 7" x 13"), 25 Regal (14-1/2" x 9" x 16-1/4"), & 25 Wine (5-1/2" x 3-1/4" x 13") bags. Made in the USA.